Sudha was in London during the third week of September, 2013. There was a concert on 21st September, followed by talk show by her on ‘Where Are The Women?’ She was in conversation with Dharambir Singh. She talks vividly about her life as a female musician and explains the role of women in Indian classical music. 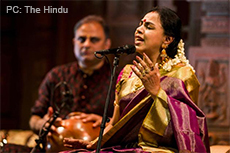 She also explains the trinity of Carnatic composers and what the differences are between the Hindustani and Carnatic classical traditions. The session explores the dichotomy between secular and religious aspects of Indian classical musicians trying to survive in India, which balances being seeped in culture and religion with one of the world’s fastest growing economies.